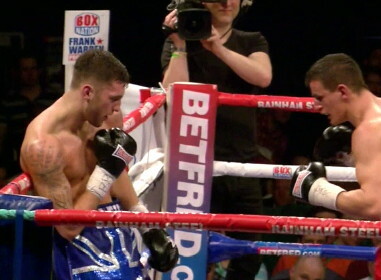 By Scott Gilfoid: After having sparred with both IBF/WBA super middleweight champion Carl Froch and WBO light heavyweight champion Nathan Cleverly, unbeaten super middleweight prospect Frank Buglioni sees Cleverly as the better fighter of the two. Buglioni attributes this to all the many hours that Cleverly has sparred with former super middleweight champion Joe Calzaghe early in Cleverly’s career. So there it is. Buglioni says Cleverly is better than Froch. Cleverly does look faster, sharper and better defensively than Froch. He also seems to throw a lot more punches than him as well. As far as the power goes, I think Froch has an advantage in that area, but it’s not a huge enough of an advantage to make a big deal about. If I had the choice to pick between a fighter that throws hard shots but not a lot of them and one that never stops punching like Cleverly, I’d have to say that Cleverly is the better fighter. I do wonder why Froch won’t fight Cleverly. It’s a fight that makes sense because both guys are from the UK, yet Froch won’t take the fight. Now why is that? I don’t know about the Calzaghe being great part, but that Buglioni is saying. Calzaghe was hardly great and I saw enough of his fights to know that he’d likely have gotten easily beaten by Andre Ward had Calzaghe not retired right when Ward emerged on the scene. I still think Bernard Hopkins got jobbed in the Calzaghe fight. I had Hopkins winning that fight by four rounds, and I was stunned at the judging for that bout. We’re going to see how good Cleverly is next month when he faces Sergey Kovalev on August 17th at the Motorpoint Arena, Cardiff, Wales, United Kingdom. If Cleverly is the real deal, he’ll win that fight, but if he’s just a hyped fighter then he’s going to get pounded out quickly by the hard hitting Russian. I have a feeling that we’re going to see Cleverly take a beating in the process of getting stopped by Kovalev.